Today I want to tell you the story of our latest workshop called Game Prototyping Workshop and how it came to be. When I first started working for Pete, he sent me to a small games convention in Brighton. At the time, we were designing a gamification solution to train managers better, called Manager’s Path. We had the basics down and a small mock-up prototype and we wanted to show it to people. I signed up for a prototyping and playtesting workshop at this convention and went there to learn more about how to prototype and playtest. The workshop was great and I learned a lot about how creative a process like this can be and how to improve on your initial ideas. The experience was so great that it really stayed with me for a long time. Sometimes you forget about a workshop quite fast even if it was interesting and helpful to you. This one wasn’t going anywhere. I instantly knew that I wanted to design and deliver a workshop on game prototyping. I really believed that it would help people that are interested in gamification understand more about games and game mechanics. 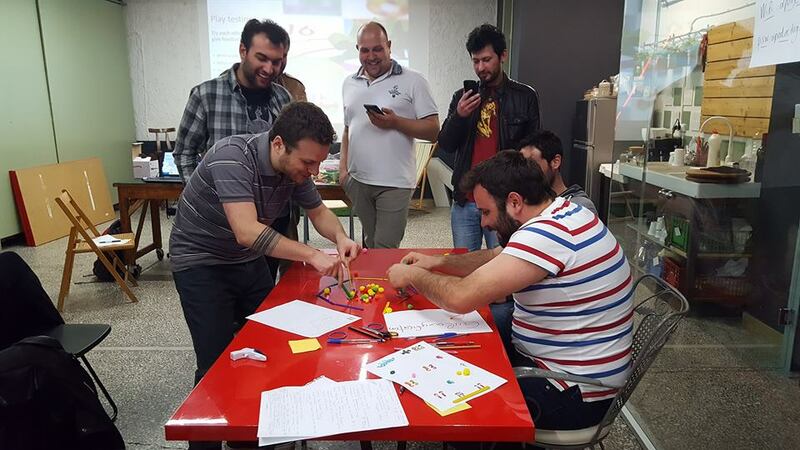 I delivered my first game prototyping workshop at the Thessaloniki Gamification Meetup and people loved it! Everyone was very excited to get their hands dirty making games and trying them out. Of course, no one was a game designer and they didn’t necessarily aspire to be in the future. They were interested in gamification and this hands on workshop helped them experience game mechanics and discover a process that can really help them improve their projects and ideas. After Thessaloniki, we tested this workshop in Brighton in a very different setting. I joined Pete at the University of Brighton during his gamification for business post-graduate elective and delivered the Game Prototyping workshop to them. Again, everyone had fun and learned a lot about how game mechanics affect the result of a gamification project. So, we decided that this is a great product that we need to share with more people and will be great if more people can get some experience on how it feels to design a game from scratch in a short period of time. We split attendees in teams and each team makes a game that then everyone tries out. From the facilitator perspective, it’s always very surprising to see what each team comes up with and see games come to life literally in minutes. Sometimes people have these elaborate plans and ideas that they bring to life by carefully designing each step and sometimes games just come out of nowhere literally in minutes. One little rule can change a game so much and make gameplay either boring or very enjoyable. Play testing is always the most fun part but at the same time the most serious. Each team can see what’s working and what needs improvement in your game. Iteration is very important both in games and gamification. Getting the right feedback from play testing is crucial if you want to improve your ideas. To conclude with, we are very happy to be offering this workshop as a GAMIFICATION+ product now to individuals and organisations. You can find more details and all the upcoming dates that you can experience this workshop for yourself at this page: https://gamificationplus.uk/game-prototyping-workshop/. Check our two upcoming ﻿workshops ﻿﻿in﻿﻿ ﻿﻿﻿﻿London﻿﻿﻿﻿ and ﻿Brighton﻿!